1919 express tiskopis(! ), response envelope with Hradčany 3h + Austrian express 2h triangle, Mi.217, nationalized CDS Uherské Hradiště 3.II.19. Light fold in envelope, otherwise very good condition Small usage! Decorative! 1918 newspaper stmp 6h Mercure blue, Mi.214, used with overprint FRANCO as postage stmp on/for printed matter to Austria, CDS Prague 1/ 30.X.18, on reverse arrival postmark Wien 2.XI.18. Decorative! 1919 letter to Austria provisional franked with. Austrian. Postage due stamps Small numbers with overprint FRANCO, Mi.P47, P48, P50, nationalized CDS Brno 1/ 3.I.19. 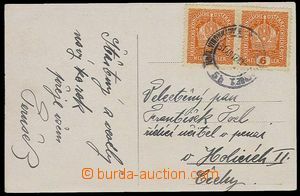 Folds, tearing in upper margin envelope/-s.
1918 Hungarian credit note without certificate of mailing, where order fee was/were paid cancel. 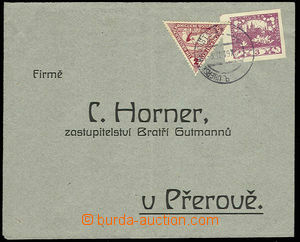 Postage due stamp 20h Small numbers, Mi.P50, very nice single circle cancel Nivnice 9/12 18, CDS Ujverbász 918 Dec.4. 1918 Hungarian money dispatch-note without certificate of mailing, where delivery fee was/were paid Austrian. to exhaustion- stamp. 20/54 orange, Mi.P62 with CDS Morkovice by/on/at Nezamyslice 25.XI.18. Posting CDS Miskolcz 918 Nov.18. Without damage. 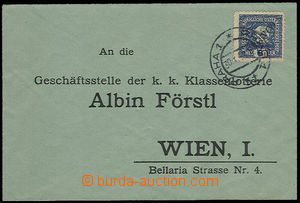 1919 parcel dispatch card segment where delivery fee was/were provisional paid express Austrian. stamp. rectangle 5h, Mi.220A, CDS Neudorf - Herrlich 25/2 19. good condition. 1918-19 7 pcs of cut-squares with frankings Austrian and Hungarian Postage due stamps., provisional used also as postage stmp, 3x 1 Koruna on cut-square accounting sheet, 1x bisected Austrian. 20h, mixed franking more issues etc.. Interesting CDS. 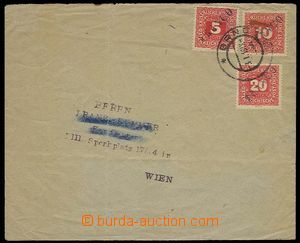 1919 without franking card as printed matter, burdened with postage-due 20h, mounted bisected Austrian. Postage due stamp small number 40h, Mi.P53, cancelled by postmark Prague 1/ 14.I.19. Without damage. 1919 bisected stamps 15 and 25h Charles, philatelic pun from Mr. Hornera - heading envelope, burdened with postage-due, mounted stamp. 2x 20h Small numbers with CDS Wien 16.I.19. Envelope potrhaná in upper margin, viewing of quality recommended. 1919 cut square from post. dispatch-note franked with. i.a. Austrian stamp. 4 Koruna Coat of arms, Mi.206, CDS Olomouc 3/ 17/2 19. 1920 cut square with Austrian newspaper stamp. 20h and red CDS Cmunt in Bohemia 31.VII.20, after/around handover Czechoslovakia.